An elegant pair of sterling silver V-shape stud earrings styled with a delicate twist. Set with a shimmering cultured freshwater pearl and delicately sparkling cubic zirconia stones. Team with a matching pendant for a coordinated look. 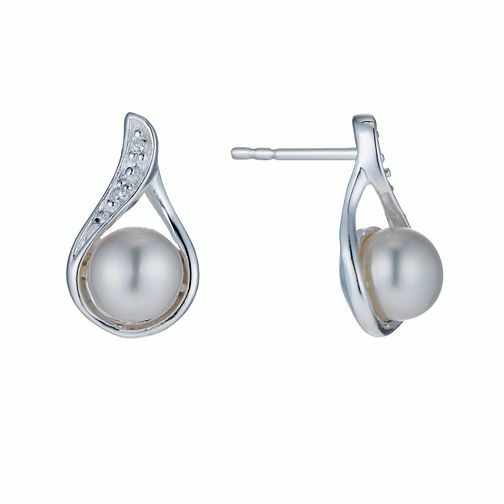 Sterling Silver Cultured Freshwater Pearl Stud Earrings is rated 3.8 out of 5 by 4. Rated 5 out of 5 by Anonymous from Beautiful earrings Got for my daughters Mother’s Day as a gift from her daughter, she loves them! Matches the pictures and description, lovely earrings! Rated 1 out of 5 by Anonymous from Poor Quality Went to take the butterfly clip off the back of the earing and they broke. Seems like poor quality to me.